Lake Superior is the world’s largest lake by surface area and the largest of the Laurentian Great Lakes. Click image to enlarge. I know journalists aren’t supposed to be biased, but Lake Superior is my favorite lake. In fact, this body of water — the world’s largest lake by surface area — is so important to me that it drove my choice of college and is also the location of my beach wedding next summer. So when I found out I was going to the Institute for Journalism and Natural Resources’ (IJNR) Lake Superior Institute, I was pretty excited. IJNR describes its institutes as “summer camp for journalists,” and I would say the language is accurate. I spent four jam-packed days traipsing around the shores of this spectacular lake, learning about various issues affecting it, and listening to a slew of speakers while watching the radio reporters in our group jockey for position, microphones in hand. Since I am a data journalist — two parts engineer, one part reporter — I mostly, sat back and wrote down the names of people that I could contact later for data. The first day was a gold mine. We spoke with researchers who are doing nothing but studying and monitoring the big lake. 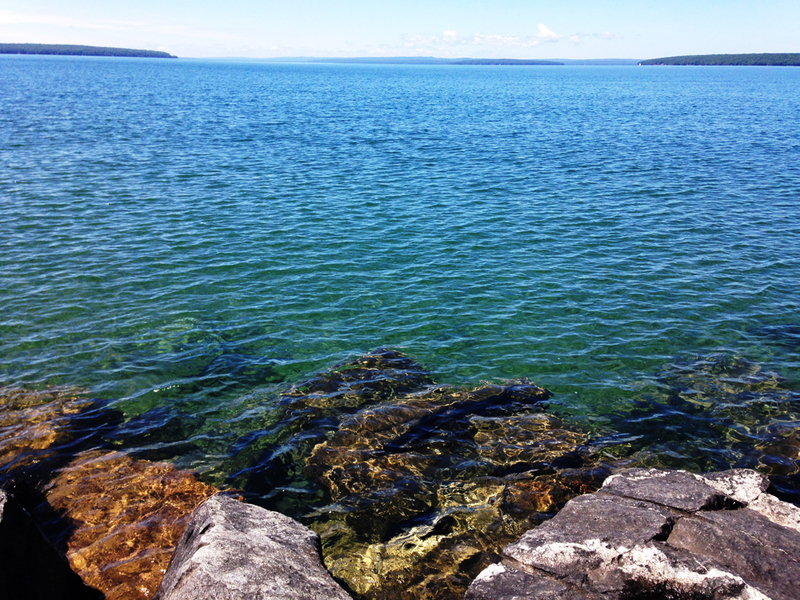 It turns out there is a surprising lack of “baseline data” for Lake Superior. In other words, it is hard for scientists to know whether what is happening in the lake biologically, physically, and chemically is unusual, because they do not know what normal is. 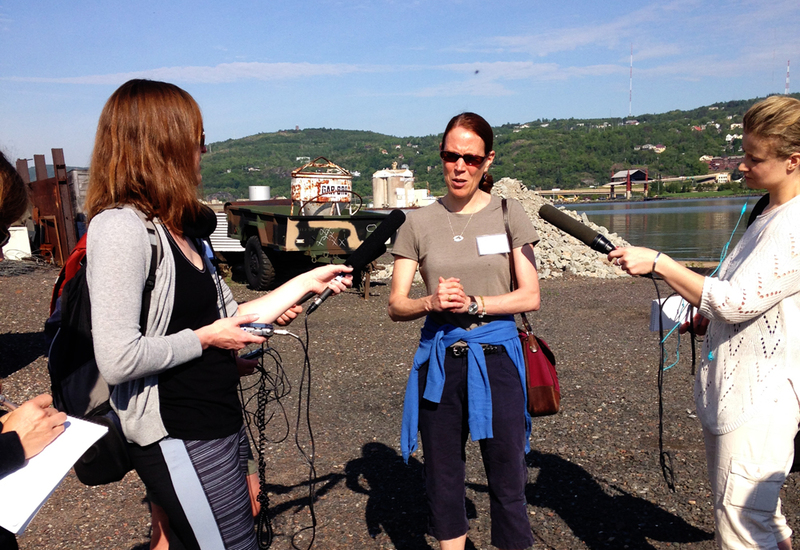 The Institute for Journalism and Natural Resources’ Lake Superior Institute was like a summer camp for journalists, where reporters could speak with experts about issues affecting the lake. Click image to enlarge. Still, it is pretty clear that the summer temperatures the lake has been experiencing are way outside the norm, a trend that is related to reduced winter ice cover. We spent the next day hanging out at the Apostle Islands National Lakeshore, which is certainly one of the most beautiful places in the entire world. Here we learned about the management of the lakeshore, listening to the perspectives and concerns of local Native American communities. Again, climate change was on everybody’s mind, whether the issue was reduced winter access to the fabled Apostle Islands ice caves — only accessible by traversing the frozen lake — or the changing composition of the local forests. We also met with a local commercial fisherman and visited a tribal fish hatchery and an aquaculture-study facility. To my surprise, I still had a massive appetite for the baked lake trout that we ate for dinner. 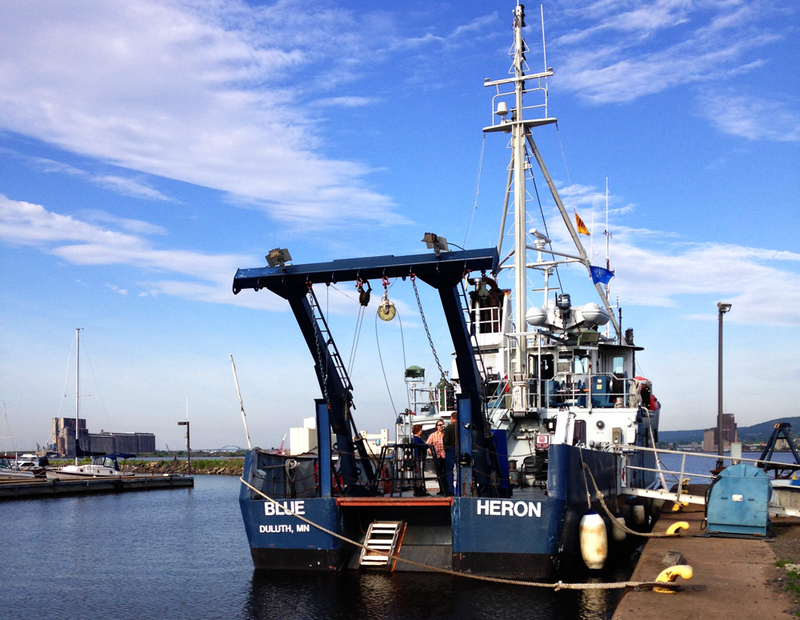 Scientists studying Lake Superior use research vessels like this one to monitor how climate change is affecting the lake’s physical, chemical, and biological characteristics. < em>Click image to enlarge. The last day, we learned about a proposal to site a concentrated animal feeding operation (CAFO) just miles from Lake Superior, near a tributary called Fish Creek. The potential piglet farm has stirred up a lot of local controversy, and the main concern of those opposed to the farm boils down to whether liquid pig manure will run off into the lake and cause a problem. One of the most interesting conversations that I had on the trip was with a farmer from Missouri who became an anti-industrial-farming activist after a pig CAFO moved in next door to him. He had traveled all the way to northern Wisconsin to try to stop this new farm that we were learning about during “summer camp.” Other local, small-scale farmers were quite welcoming to the CAFO. They were of the opinion that an industrial-scale hog farm would work in their favor economically, and they also worried that local opposition to farming of any size could hinder potential plans to expand their own operations in the future. After three full days, I departed for Minneapolis. I got on the plane to Duluth exhausted and a bit overwhelmed with information but eager to continue reporting on my favorite lake. Do you live, work, or play near Lake Superior? What do you think are the region’s biggest issues and challenges? I would love to hear from you! You can comment below, send me an email at kaye@circleofblue.org, or tweet @GreatLakesKaye.